We all know how to check EPF Balance online on portal. However many of us may not be aware that now one check EPF Balance via SMS. After successful implementation of UAN Number and PF Number portability government is back with unique initiative of checking EPF balance on the move via SMS. Let us discuss about SMS service for EPFO in detail. In order to know EPF balance via SMS it is mandatory to have UAN (Universal Account Number). You can check your UAN status by visiting EPF website. 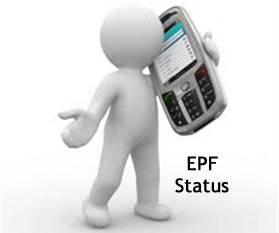 To Check EFP Balance you (EPF Member) need to send SMS in predefined format from your mobile number. 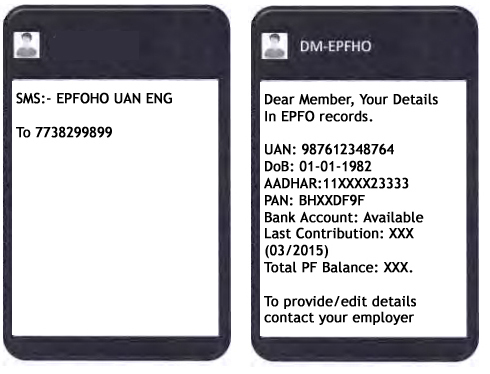 The format of the SMS is EPFOHO UAN followed by first three characters of preferred language. If your preferred language is English than SMS format will be EPFOHO UAN ENG. You need to send this message to 7738299899. Please note that it is mandatory to use registered UAN mobile number while using this facility. This facility is available in 10 different languages namely English, Hindi, Telugu, Punjabi, Gujarati, Marathi, Kannada, Malayalam, Tamil & Bengali. Once message is processed at EPF office you (EPF Member) will receive message containing detail about UAN Number, Last contribution and Total PF Balance. A member will not receive his/her contribution details if none of AADHAAR, PAN or Bank A/C is digitally approved and provided by the employer. This is very good initiative by government of India and we must publicize and use this facility. This SMS service is easy and convenient way to know epf balance on the move. As this facility is available only for UAN activated members only, many more members will willingly register for UAN and it will boost UAN initiative also. Dedicated helpdesk service is launched by EPFO for this. Toll free number 1800118005 is assigned to this helpdesk. You can contact on this helpdesk from 9:15 AM to 5:45 PM for all your queries related to UAN and SMS service. Dear Divya, It seems your UAN is not activated or incorrect. First get your UAN activated and then check PF balance using EPFOHO. I got message from EPFOHO for password. but i don’t have UAN number. so how can I get UAN?? Contact your employer to obtain your UAN . Your UAN is readily available with employer. I have no UAN . I got only password by a message . so how can get UAN. Every month if present balance of EPF is sent. It will be better for us.Kindly create system. Now you can check EPF balance on the move by downloading EPF Mobile app.